The elite fighting force that is the RAF Regiment (aka The Rocks) are to the Royal Air Force what the Marines are to the British Navy. These guys are extremely tough - and to make the rank of Flying Officer doesn't just take brawn, it takes brains too. As part of a new drive to help recruit the rare few with the right stuff to become RAF Regiment Officers, FHM Magazine launched a National open contest of absolute mental and physical toughness to see who has what it takes to make it through what they call "The Rock Hard Challenge". For the FHM spread I photographed Flying Officer Anthony Bird, who will be the man to beat in the contest which takes place in January 2010. 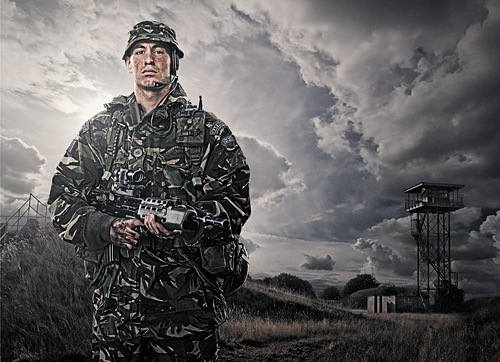 Shot on location at RAF Honington, Suffolk. Post production by yours truly. December Issue out now.